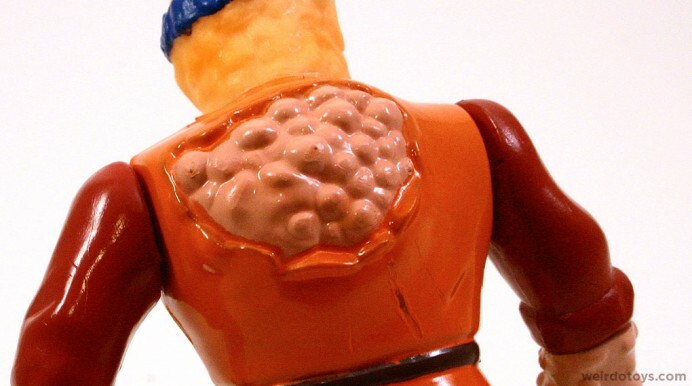 Ever find yourself buying a toy simply for the horrendous (or hilarious) packaging? It’s rare that I do that, but in this case, that’s just what happened. I discovered this MONSTER toyline last year, and not only did I love its generic, non-committed name, but I immediately fell in love with its packaging. 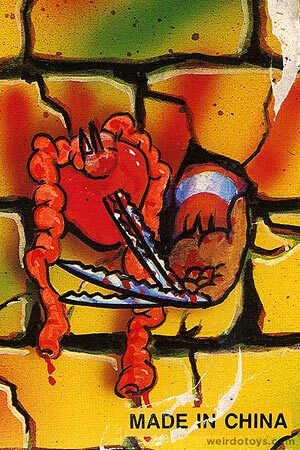 The front of the card features a very weird illustration collecting some “classic” monsters, but the thing is, they’re all a bit out of character and just odd-looking (well, more odd-looking than usual). It really looks like they’re all breaking out of a prison or mental ward or something. There’s barbed-wire-covered brick walls they’re all bursting out of (actually, with the city skyline in the background, it looks more like they’re bursting into the prison). And not only that, they’re carrying knives and straight razors and stuff. These monsters don’t mess around. You thought they were dangerous before? Now they’re armed! If you cross paths, you are definitely screwed. The look of this piece really reminds me of those funky hand-painted, amateur Hollywood movie posters. Chuck Norris poster image courtesy of “GroGraphics.com“. Thanks! 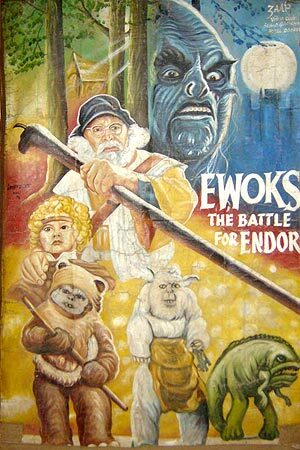 Ewoks poster image courtesy of “FunnyGarbage.com“. Thanks! So here’s the headliner. Lets call him “Toximodo.” He looks like a cross between the Toxic Avenger and Quasimodo. 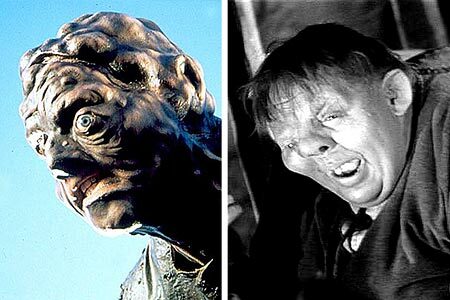 Looks like old Toximodo here got top billing in the monster lineup. Not sure why. I’m guessing he’s supposed to look like Quasimodo (or the Hunchback of Notre Dame or whatever you wanna call him). 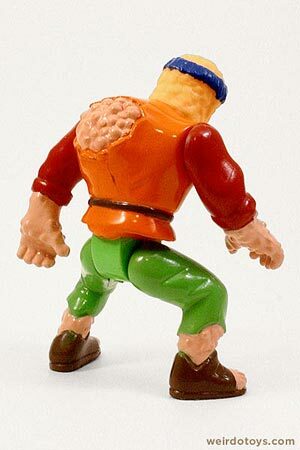 Is a deformed hunchback not scary enough? 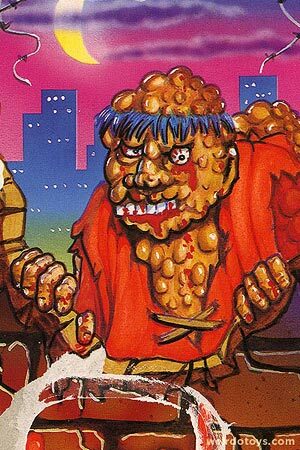 These guys really wanted to take him up a notch by adding boils, warts, cysts or whatever those are supposed to be. Yech! He’s covered in oozing, bubbly flesh mounds. Even his hump is bumpy. And of course, the haircut. Gotta love the haircut. Oh. One last thing. What the hell’s up with that thumb? Has it been severed? Next is a severed green hand nailed to the wall. Wait. Scratch that. 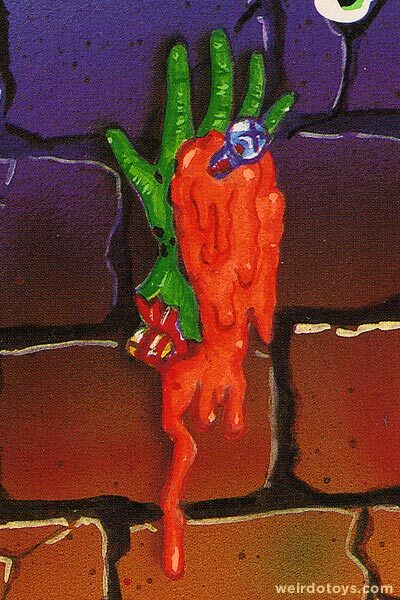 It’s been screwed to the wall (Phillips head), and it’s oozing orange blood/slime. Looks like it might’ve belonged to the Frankenstein Monster, but he’s got all his appendages. I guess it’s from some unlucky passerby. Next we have the Mummy. He’s looking a bit maniacal. 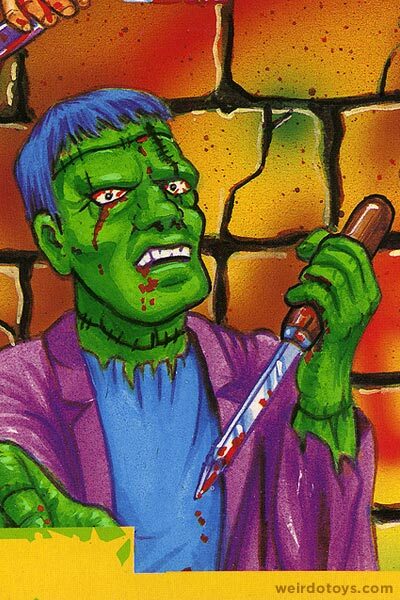 He’s got a bloody straight razor, and he’s definitely eyeballing the green hand. Must be admiring his handy work (seriously no pun intended). Again, to take up the gross factor, they’ve given this guy an exposed brain. Awesome. I thought Mummies had their brains pulled through their noses before they were prepped for “mummification.” Maybe this is just a mental patient. Something else that’s weird is the additional bandaged mummy hand bursting through the wall. 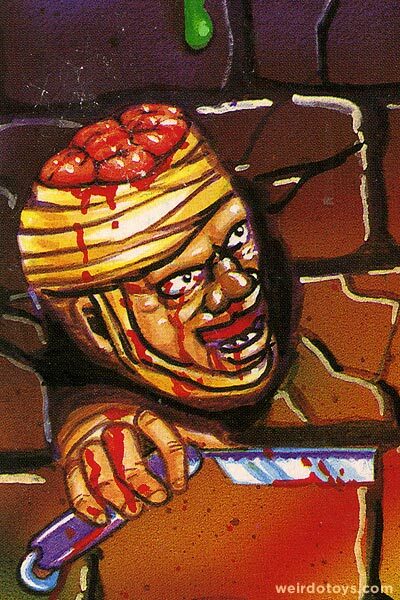 It’s a right hand, but we can see the mummy’s right hand is delicately holding a razor. Oh well. Why worry about details like that? Next we have the Frankenstein Monster. He’s got a big knife/ice pick looking thing. It’s already bloody, which means he’s already stabbed somebody (or cut himself). Careful. he’s reaching for you. Also, it looks like he’s been crying blood. You know he’s evil if that’s the case. Wonder what that yellow block thing is (more on that later). Wow! It’s Freddy’s glove poking through a hole in the wall. Looks like he’s playing with someone’s heart… a heart with intestines attached to it. I love how it’s delicately balancing on the blades. Serrated blades no less. This character inconsistency goes well with his candy-cane-colored sweater. 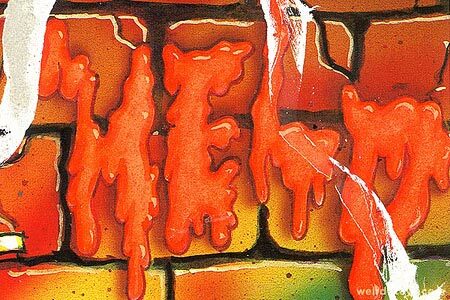 And lastly we have this simple message scrawled in orange blood/slime, “HELP.” Ha!! My sentiments exactly. 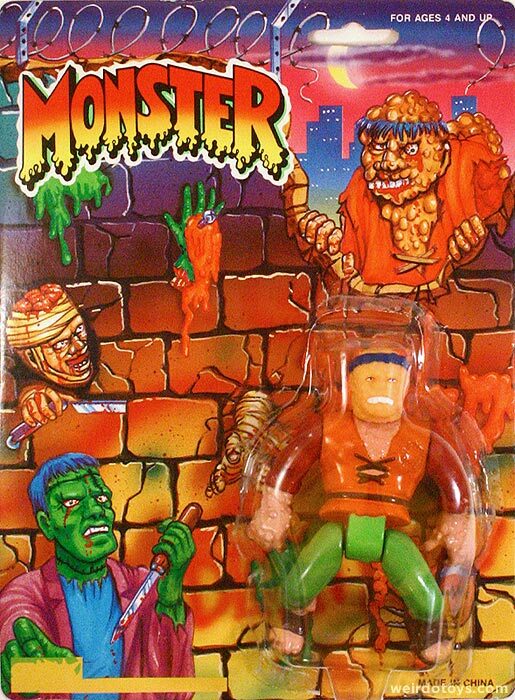 As I mentioned previously, I discovered the MONSTER toy series last year sometime. 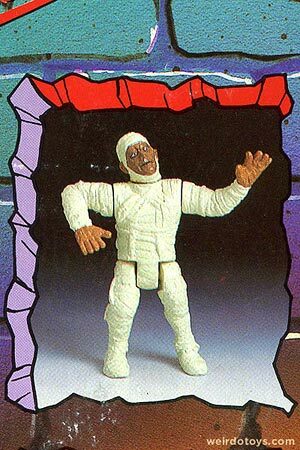 I actually stumbled upon the Mummy figure from this toyline first. I wasn’t in love with the Mummy figure as much as I was his packaging. In fact, I was gonna do a blog entry focusing strictly on his package (wait… lemme rephrase that). But one look at the back of the card made me realize I HAD to find the hunchback figure. He was so gloriously disfigured, melting and angry. Well, luckily for you (and especially me), I found him. Now lets’ take a look at him. One of the things I immediately noticed is how different this character looks than the one featured on the package. On the back of the card, he has a pained, evil grimace. This guy looks like a chubby monk with acne and a bad overbite. His hair even looks like a headband. 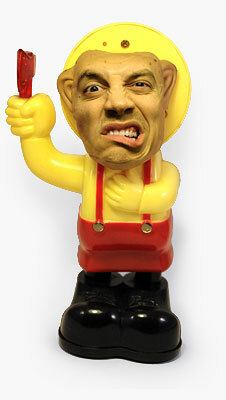 Not nearly the horror we grew to love from the front of the package. But, to make up for it, His bubbly, exposed skin is fantastic. Really, really gross. Look at that hump! It looks like a bowl of baked beans or something. That is truly nasty. I love how his hump burst through his shirt. That’s one strong hump ya got there. Now, let’s check out the back of the card. I’m gonna show you details of the characters pictured here, but notice how none of them are listed by name at all. We’ll just have to guess at who they’re supposed to be. I’ll try not to go into as much detail as I did with the front of the toy card. Seems like a standard Mummy figure. 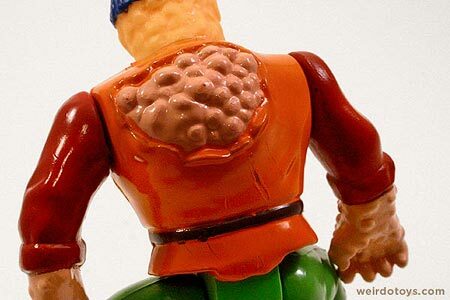 I have this figure, and his brain is not exposed. Bummer. Also, take note – most of the toys you’ll see here will have this same dance pose. Yep. It’s Freddy. 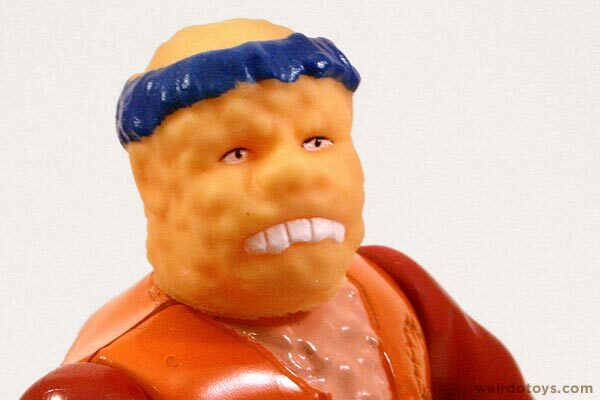 But this looks more like your friendly, retired, neighborhood Freddy. You might even leave a fruitcake at his doorstep for Christmas. 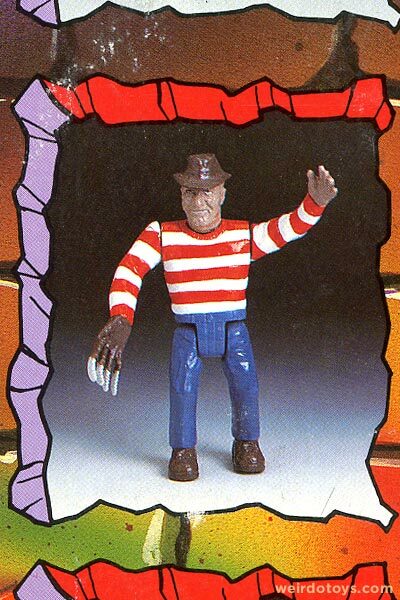 He’s got the candy cane stripes and blue jeans, so you know it’s gotta be casual Freddy. Wow. 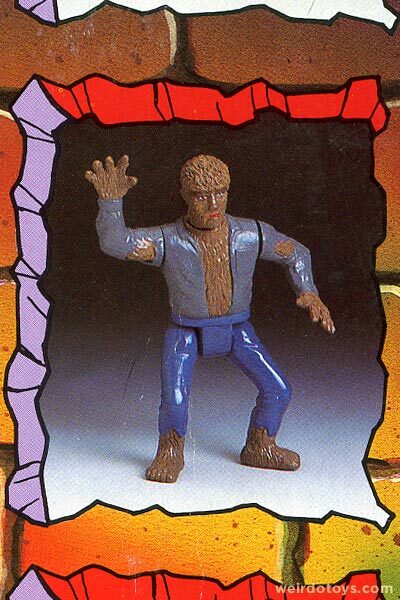 Looks like your typical Wolfman toy. He’s just doing an awkward dance, that’s all. Yeah, yeah, yeah. 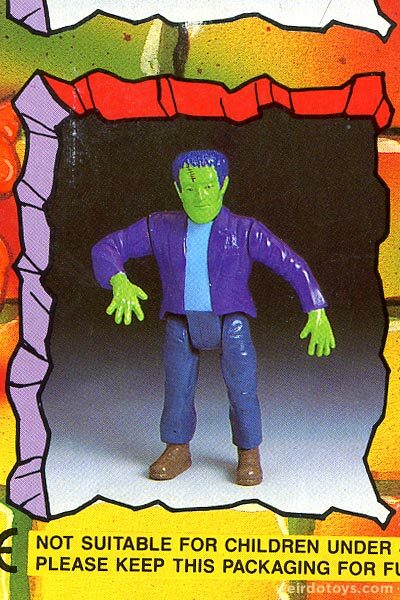 I’m not calling him Frankenstein. I don’t know why I’m being so literal. Just trying to respect the legend I guess. His pose reminds me of the Franken- Wiggler I featured a while back. Wow. Is this guy a circus ring leader or what? I’ve never seen Dracula wearing such vibrant, goofy clothing. Or should I say, I’ve never seen the Joker with such big fangs? One other detail I wanted to show you was this very goofy warning on the package. What? Keep the package as reference for the age limit? As a reference to which characters to collect? I dunno. It just struck me as funny. As far as who made these and when they were released? That’s still a mystery I think. There are no markings on the packaging or on the figures themselves. Any info and other insights are definitely welcome. Thanks. 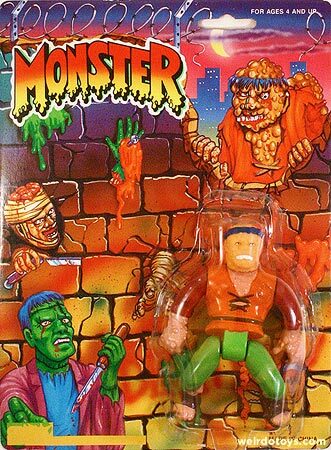 • Buy Vintage Monster Figures on eBay! 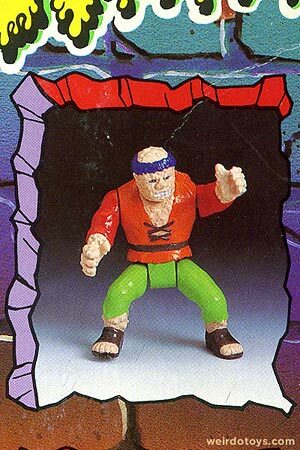 Haha great find, when Facebook alerted me about a mix between Toxie and Quasimodo I thought about that one classic turtles figure with the trashcan on it’s back. While trying to find a reference link for the above mentioned figure I came across this and I’ve been desperately trying to find out if this is just a mod or if this is an actual figure that hasn’t been released yet. The Phil Hartman Dracula is the best! What an awesomely crappy find! 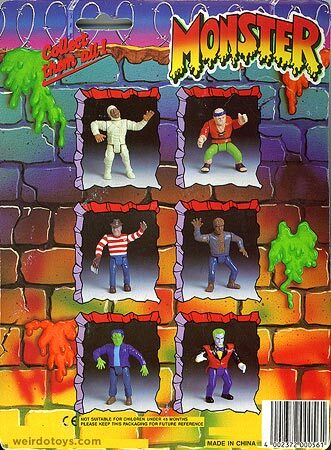 I wonder why each monster minus Frank and drac are suffering from leprosy? The gore filled details on the packaging are sweet! Great work again. Perhaps you could do some part time work on Unsolved Mystery’s or as a Private Detective. It’s awesome how you can track down as much information that you do. I hope everyone realizes how much time and effort goes into this website. Again great work. dracula’s snazzy outfit is awesome. I like when you show off all the choices to compare to the one you picked, because then I secretly pick out which one I would get — definitely the dracula in this case. Thanks for going into all the details. Definitely a fun read. Its the crummy design/illustration combined with the terrible figure that makes a truly oustanding weirdo toy. ps. 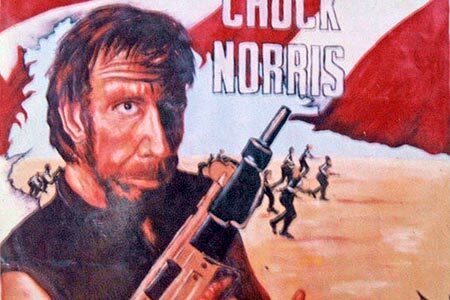 I want a Chuck Norris toy w/ that painting used for the packaging. @ The King of Bootlegs – Ha! He is Phil Hartman Drac. Also, glad you liked the packaging details. I just thought the package was too great NOT to show like that. @ Oldman – Thanks for noticing. It is a bit of work putting all of this together. It’s not as simple as swiping other people’s images or re-blogging what someone else has already done. Thanks for the encouragement. @ Jason – Glad you liked the details. Liek I said, this was just an instance where I felt compelled to feature as much as I could form the packaging. 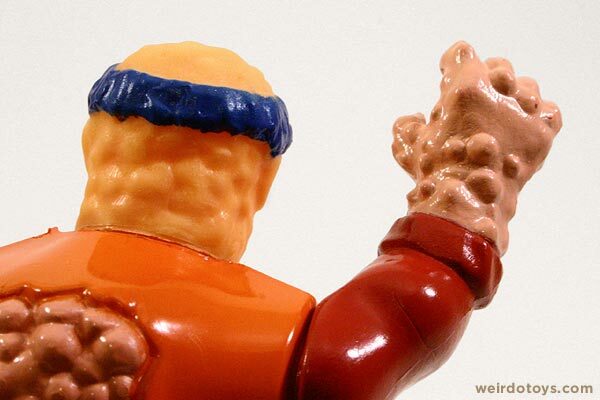 Oh, and a screwed up Chuck Norris toy like that would be great wouldn’t it? That mummy looks suspiciously like the one they made for the Tales from the Crypt line. This honestly looks like the type of thing that would have been given away as a boardwalk or arcade prize YEARS ago. This definitely would have been worth my 250 skiball tickets! I think the freddy figure looks like he wants a hug, hmmm it just so happens that toximodo has his arms positioned to give him one as well, how sweet. maybe this is actually a disfigured face support group meeting. I’m speechless right now, but this is, without doubt, my favorite post of yours, Justin! Nice work! I love the Draculoker…Count Jokula…whatever. BTW – where did you find these guys? @ Ben – I would love to win these things playing Skeeball! Too bad it would take a couple hundred games of Skeeball to earn enough tickets. @ Patrick – Crap. I didn’t make that connection. Good point. @ mistuh_t – Even monsters need love. @ BubbaShelby – Jokula is funny 😀 I found them on eBay btw. Wow, talk about a blast from the past, I used to have the whole set of these when I was a kid (I’m 22 now). I used to think it was so cool owning a Freddy Kreuger action figure. I had no idea you could still get these! The package art reminds me of what you might find airbrushed on a totally ghetto carnival midway haunted house at some lame county fair. Really awesome stuff. I greatly enjoyed this post. Thanks! These are great, they are like a really bad b-movie. So bad that its good! 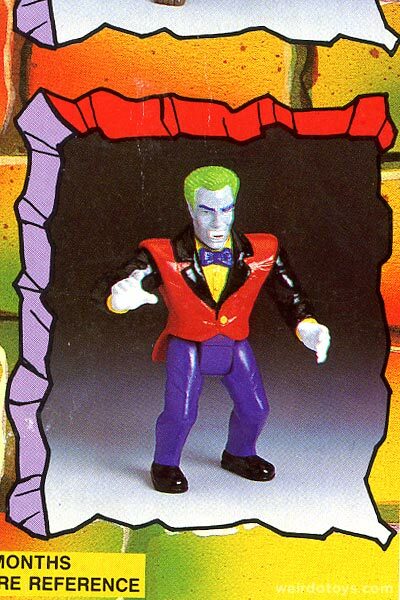 Dracula looks like a cross between a crappy birthday party magician and the Joker from Batman. I didn’t notice the Help message or freddy’s glove. where are they? They’re there in the blog entry. Maybe you had a problem with them loading. I meant on the box. in the front and back views you gave I did not see. 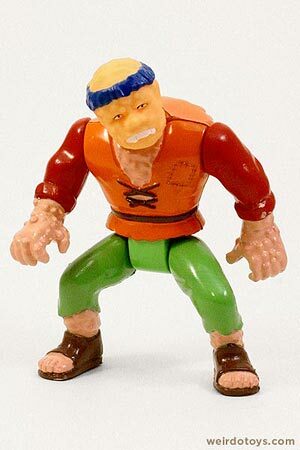 Even as a youngster I appreciated how oddly nasty he seemed compared to the rest of my toys. 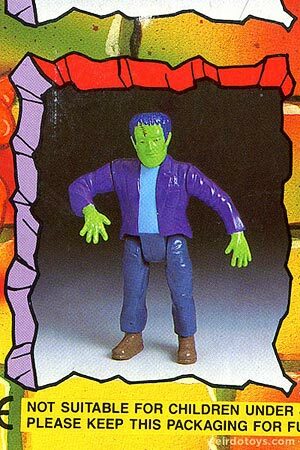 hey justin, i’ve got a spare loose Frankenstein’s monster from this line if you’re interested. I LMAO at this post. The analysis of the package was sheer brilliance! Haha, what a great find!